For a trouble-free move to Benicia, Meathead Movers is the company for you! Our professionally trained student-athlete movers are ready to get you into your new home. Right on the coastline, Benicia is a water-lover’s and artist’s dream. If you’re thinking about moving in order to enjoy the coastal lifestyle or to join the growing arts scene in the area, you’ll want to check out how Meathead Movers can help. This waterfront city in the San Francisco Bay Area boasts a distinct, small town charm and a high quality of life. Not only can residents enjoy all the usual water recreation activities including sailing, boating, fishing and swimming, but residents can also enjoy several farmers’ markets, art exhibits, peddlers fairs, and parades throughout the year. With plenty of community and recreational events and great parks and schools, Benicia is ideally-suited for kids. Its beautiful waterfront, bustling art community, and wide variety of shopping and dining options make it a perfect place for adults as well. 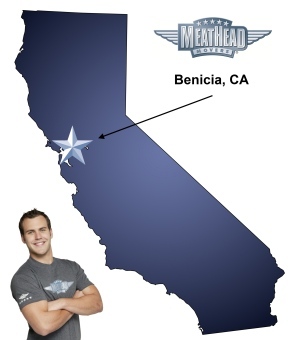 If you are considering moving to Benicia, you should make Meathead Movers your mover of choice! One of the main advantages to using Meathead Movers is the quality of movers that we hire. Unlike other movers who hire temporary help, we only hire hard-working, polite, clean-cut student-athletes who are trying to make a bit of extra money for their education. Our movers also jog while not carrying your items to save you valuable time, and offer fixed pricing plans for long distance moves; that way you aren’t surprised by hidden fees. In addition to long-distance, local and commercial moving services, we also offer a packing service, short- and long-term storage options, and our special concierge service. In order to make your old or new house move-ready in time, we can connect with service providers in your area such as house cleaners, landscapers, electricians, and even babysitters! As you can see, moving doesn’t need to be a hassle when you choose Meathead Movers. We are so confident in our services that we even offer a 100% satisfaction guarantee! So what do you have to lose? Give us a call to learn even more about all the services we offer or to receive a no-obligation, free moving estimate. Moving to Benicia? Here are some helpful resources.